MIAMI, Fla., February 12, 2019	(Newswire.com) - KoreConX is proud to announce Dara Albright will be participating in the Investor Relations Fireside Chat at their KoreSummit in Miami next week. Mrs. Albright is one of the top global leaders when it comes to fintech and the crowdfunding movement, being one of its earliest pioneers. Her views, which have been published in leading-edge articles, white papers, webinars and conferences, have helped give birth to and shape the crowdfunding industry since its inception in 2011. She was also responsible for the first ever U.S. crowdfunding conference, and will now share her expertise with the KoreSummit audience. 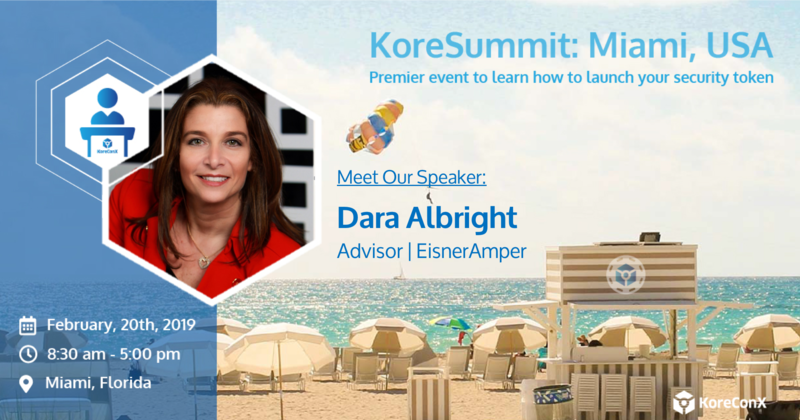 Dara Albright will be speaking during the afternoon at the KoreSummit in Miami. An invite-only, educational event which brings together top thought-leaders in securities law, capital markets, secondary markets, investor relations, compliance, and marketing in the private company sector. More information regarding the event, including agenda, can be found at https://www.koresummit.io.